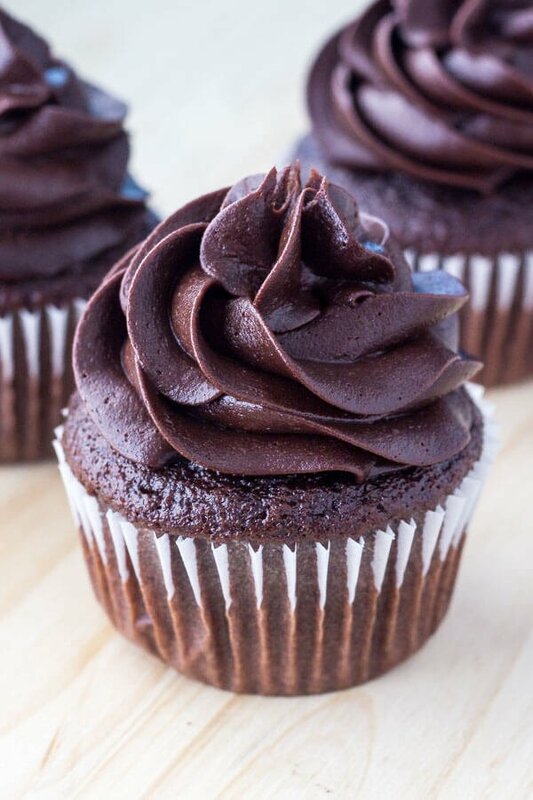 Creamy, fluffy homemade chocolate buttercream frosting is perfect for cupcakes, layer cakes or brownies. 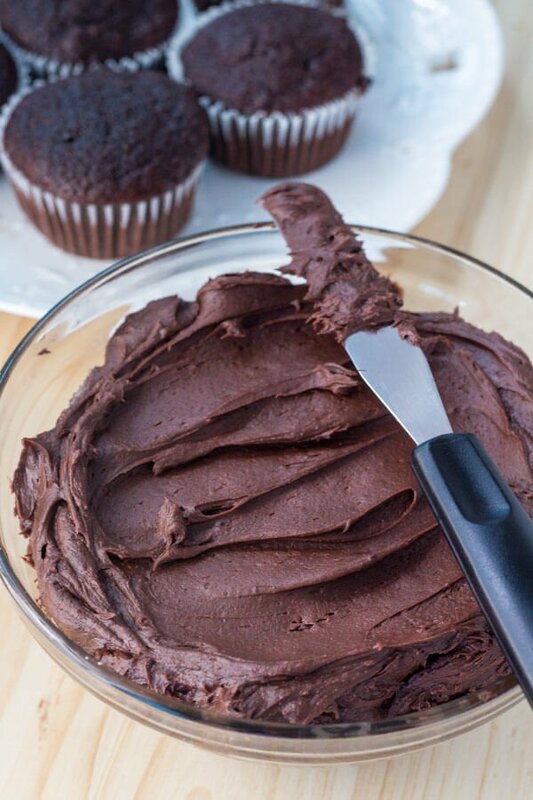 Made with cocoa powder so there’s no fancy ingredients – this chocolate frosting is the perfect recipe for any baker! I absolutely love frosting. 100% – I’m the person who’s eating it from the tub with a spoon and asking for the corner piece of cake because it has more sweet, creamy buttercream goodness. Some people might think it’s embarrassing to admit these things, but I have no shame. And frankly, I’m proud of my frosting addiction. 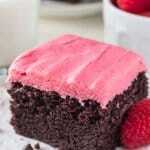 So I figured it was time to share my favorite recipe for Chocolate Buttercream Frosting. It’s creamy, fluffy, super chocolate-y goodness that’s perfect for cupcakes, brownies or cake. Or… you know, licking off a spoon. You can also add a touch of instant espresso powder to help cut the sweetness, but that’s totally optional. Because we’re using real butter, the frosting is smooth and flavorful without that oily after taste you can get with shortening. Then the whipping cream makes it extra fluffy and creamy. You could substitute milk instead – but I find whipping cream or heavy cream gives the best texture and flavor. Seriously – it’s creamy fudgy chocolate buttercream frosting deliciousness. 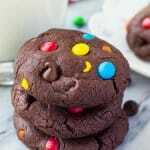 This chocolate buttercream frosting is my go-to recipe, and if you’re looking for the perfect chocolate icing – then this my friend is for you! Creamy, fluffy homemade chocolate buttercream frosting is perfect for cupcakes, layer cakes or brownies. Made with cocoa powder so there's no fancy ingredients - this chocolate frosting is the perfect recipe for any baker! In a large bowl, beat the butter until no lumps remain (about 2 minutes). Turn the mixer to low and beat in 2 cups of the powdered sugar. Once combined, beat on medium-high for 15 seconds. Then beat in the cocoa powder, vanilla, instant espresso powder (optional), and salt. Then beat in the rest of the powdered sugar about 1/2 cup at a time, alternating with 1-2 tablespoons of whipping cream until the desired consistency and sweetness is reached. Once everything is combined, beat on medium-high speed for 15 seconds. Recipe makes enough for 18 cupcakes using a piping bag, or 24 cupcakes if frosting with a knife. 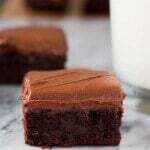 Recipe can be halved for an 8x8 or 9x9 inch pan of brownies. Makes enough for one 2 layer 8 inch round cake. Or multiply by 1.5 for a 3 layer cake. And if you love frosting – may I recommend a few recipes to go with it?